Browning Rubber Grommeted Mounted Ball Bearings Are Designed To Adjust For Misalignment And Dampen Noise/Vibration. 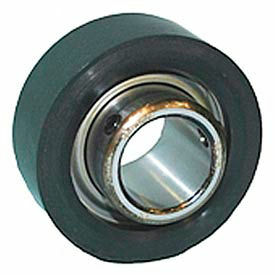 Rubber Grommeted Mounted Ball Bearings are constructed of rubber for long lasting durability. Bearing Inserts are setscrew lock and a contact seal insert unit and designed to fit into web mount support for light duty applications. Provides quieter operation and less vibration. Zone hardened inner race provides a fully hardened ball path while leaving the rest of the inner ring unhardened, allowing better holding power. Temperature ranges are from -20° to 200°F. Bore diameters are 1/2 in., 5/8 in., 3/4 in., 15/16 in. and 1 in. Browning ER Style Ball Bearings Are Used For A Variety Of Normal Duty Transmission Applications. ER Style Ball Bearings are constructed with a nylon retainer and grade 10 balls for quieter operation and less vibration and for long lasting durability. Critical dimensions interchangeable with industry standard ER units. 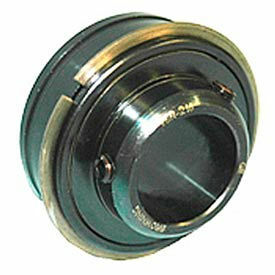 Cylindrical outside diameter incorporates locating snap ring for easy installation and positive location. 120° balanced set screw position provides balanced three-point contact that minimizes vibration, reduces noise and improves locking reliability. Precision manufactured, diamond faceted set screws improve clamping and resist backing out. Grease port in outer race provides easy relubrication. Temperature ranges are from -20° to 200°F. Available in 28 bore diameters from 1/2 in. to 3-3/16 in.